The combination of Ryan Johnson’s steady play at even strength and one of the United States Hockey League’s most effective power plays has put the Sioux Falls Stampede in the Clark Cup Playoffs and sent them into the final week of the USHL season fighting for a first-round bye. The Stampede have just two regulation losses in their last 11 games, going 6-2-2-1 to move into a tie for second place in the Western Conference with the Waterloo Black Hawks. The top two teams will receive the first-round byes. “We’re just trying to focus on getting into that playoff mentality where every game is crucial and you’re always in a must-win situation,” said Johnson, a 17-year-old defenseman from Irvine, California. “We’ve kind of been there for a couple of weeks now. It is a type of game in which Johnson, a steady left defenseman, thrives. Johnson has been even or plus in each of the last seven games, putting him at plus-6 total for that stretch and tied for the team lead at plus-20 on the season. Johnson is second on the Stampede among defensemen with 24 points, six goals and 18 assists. “It’s a lot more anticipation before games,” Johnson said. “A lot more, I wouldn’t say pressure, but more of a do-or-die kind of feel. Johnson received an early introduction to the nuances of the game of hockey. His father, Craig Johnson, is a development coach with the Los Angeles Kings after a playing career that included multiple USA Hockey appearances and 557 games in 10 National Hockey League seasons with the Kings, St. Louis Blues, Mighty Ducks of Anaheim, Toronto Maple Leafs and Washington Capitals. Ryan Johnson is prepared to follow at least one step of his father’s playing career with his commitment to play at the University of Minnesota in 2020. He also has added some early international competition with a gold medal as part of the U.S. Junior Select Team in the World Junior A Challenge in December. Johnson has done most of his damage with the Stampede at even strength. He is the team’s second-highest scoring defenseman with six goals and 18 assists in 50 games as a rookie. 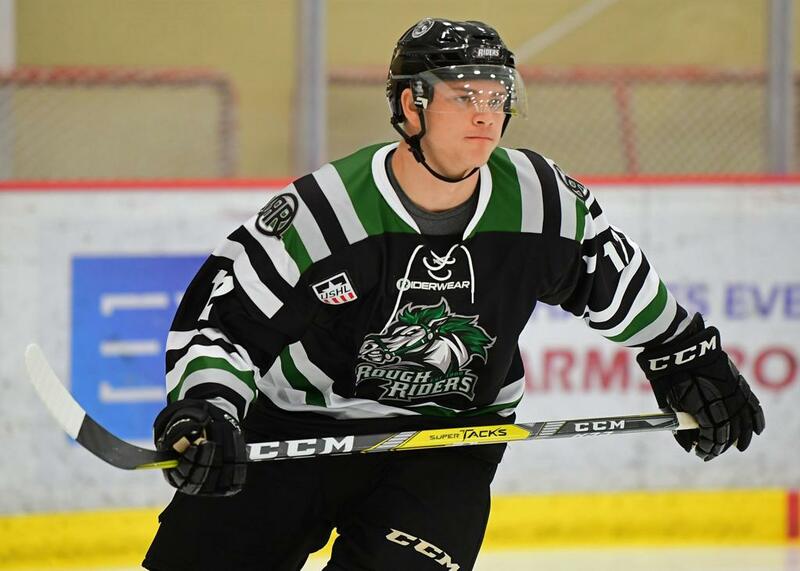 In recent weeks, Johnson has also appeared more often on a Sioux Falls power play that ranks fourth in the 17-team league in power-play percentage at 23.4, tied for fourth in power-play goals with 54 and tied for fourth in fewest short-handed goals allowed with five. The highly balanced Stampede has six players on the team with between 17 and 23 points on the power play and nine players who have scored between 38 and 48 total points on the season. Photo courtesy of Hickling Images.